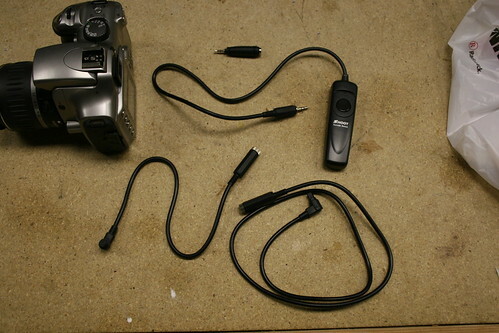 A bit ago, I purchased two remote shutter releases for my Canon 20d. The plan was to keep one, and convert the other into a time-lapse controller by removing the remote and adding a 555-timer circuit. This is all well and good, but I still couldn't attach either to my old EOS 350 Rebel. After thinking about it some, I've added 1/8 inch stereo jacks to all my remote release gear. This way I can swap cameras, control multiple cameras with a headphone splitter, and when I have time to build the time-lapse rig, I just have to add a 1/8 inch plug to it and it will work with everything else. I did consider going with 2.5mm (headset jacks/plugs) connectors, as that is what older Canon SLRs used for remote releases, but one thing troubled me - long 2.5mm stereo extension cables are hard to find while any electronics store will have a 1/8th inch stereo headphone extension. Instead I bought a headphone->headset adapter for the old Rebel.